Blood or plasma cocaine levels are not clinically useful, although they may be advisable to be done in medico-legal cases. · Blood or plasma cocaine levels are not clinically useful, although they may be advisable to be done in medico-legal cases. Qualitative urine tests using kits may be helpful in clinical diagnosis (by utilising chromatography, radioim-munoassay, enzyme immunoassay, fluorescence polarisa-tion immunoassay, and enzyme-multiplied immunoassay technique). Cocaine metabolites can be identified in the urine and provide a method for qualitatively identifying suspected cocaine poisoning or abuse. Benzoylecgonine, the major metabolite of cocaine, can usually be detected in urine for 48 to 72 hours after cocaine use. o Hair analysis: Cocaine benzoylecgonine and ecgo-nine methylester can be analysed in hair samples by GC-MS and RIA. This can be done in adults, as well as in any infant whose mother was a cocaine user. It must be noted that external contamination of hair can occur from crack smoke, but that can be washed off, whereas systemic exposure is not affected by washing the hair. o ECG: Non-Q-wave myocardial infarction, with the pres-ence of a T-wave infarct ECG pattern is often seen in cocaine users. During acute cocaine use abnormalities are more prevalent, and the QT interval is prolonged. Two-dimensional echocardiography may be useful in detecting the presence of new regional wall-motion abnormalities in patients experiencing cocaine-induced chest pain. o Troponin levels may be more useful in evaluating potential myocardial injury than creatinine kinase. o Acid-base abnormalities: Arterial blood gases incocaine abusers show a pH varying from 7.35 to 7.5. Alkalosis (pH > 7.45) is caused by hyperventilation, and is manifested by tachypnoea and low PaCO2. About one third of patients show evidence of acidosis which may be the result of hypoventilation secondary to depressed mental status or chest trauma. Metabolic acidosis is not uncommon, and usually results from convulsions, agitation, or trauma. o Estimate serum creatine kinase for evidence of rhab-domyolysis. Monitor renal function and urine output in patients with elevated CPK. o X-ray: Body packer syndrome can bediagnosed by plain films of the abdomen in the supine and upright positions. However, false negatives have been reported. Radiography may not detect cellophane-wrapped packets or crack vials. Even false-negative abdominal CT scans have been reported. It is therefore advisable to perform a contrast study of the bowel with follow-up X-rays 5 hours after the oral ingestion of a water-soluble contrast compound such as meglumine amidotrizoate (50 ml). Daily views are performed there-after until negative views coincide with the passage of two drug packet-free stools. Activated charcoal adsorbs cocaine in vitro under both acidic and alkaline conditions, and can be administered in cases of ingestion. –– Minimise physical activity and sedate with benzo-diazepines. –– Ice baths, packs, cool water with fans, etc. –– Oxygen D50W (as necessary). –– Diazepam 5 mg IV or lorazepam 2–4 mg IV titrated to effect. –– Paracetamol 2000 mg (in the form of 500 mg rectal suppositories). –– Severe, intractable cases may respond to dantrolene (1 mg/kg) every 6 hours. Alternatively, bromocrip-tine can be administered orally in a nasogastric tube. –– Diazepam 5–10 mg IV, or lorazepam 2–4 mg IV titrated to effect. –– Antipsychotics such as haloperidol or droperidol, and phenothiazines are not recommended since they can induce malignant hyperthermia and convul-sions. –– Phenobarbitone 25–50 mg/min up to 10–20 mg/kg. –– If seizures are not controlled by the above measures, consider continuous infusion of midazolam (0.2 mg/ kg slow bolus, or 0.75 to 10 mcg/kg/min as infu-sion), or propofol (1 to 2 mg/kg, followed by 2 to 10 mg/kg/hr) or pentobarbitone (10 to 15 mg/kg at a rate of 50 mg/min, followed by 0.5 to 1 mg/kg/hr). –– Intractable convulsions may require neuromuscular paralysis with intubation and mechanical ventila-tion. d. Cerebrovascular accidents: Neurosurgical consultation is mandatory. -- Labetolol 10 to 20 mg IV, repeated every 10 minutes (max: 300 mg). -- Oxygen by nasal cannula (5 L/min). -- Monitor cardiac status. -- If systolic BP is higher than 120 mmHg, admin-ister nitroglycerine sublingually (up to 3 tablets or 3 sprays of 0.4 mg each). -- If pain does not respond to nitroglycerine, use morphine (2 mg IV titrated to pain relief). -- If chest pain is strongly suggestive of a myocar-dial infarction, consider thrombolytic therapy. -- Diazepam 5 mg IV, or lorazepam 2–4 mg IV titrated to effect can prevent excess production of catecholamines by the CNS. --Diazepam 5–10 mg IV, or lorazepam 2–4 mg IV titrated to effect (if indicated). -- Diltiazem 20 mg IV, or verapamil 5 mg IV -- Adenosine 6–12 mg IV for AV node re-entry -- Cardioversion (if necessary). –– Ventricular arrhythmias: Obtain an ECG, institute continuous cardiac monitoring and administer oxygen. Evaluate for hypoxia, acidosis, and electrolyte disorders (particularly hypokalaemia, hypocalcaemia, and hypomagnesaemia). -- Hypertonic sodium bicarbonate: Sodium bicarbonate may be useful in the treatment of QRS widening and ventricular arrhythmias associated with acute cocaine use. A reason-able starting dose is 1 to 2 mEq/kg repeated as needed. Monitor arterial blood gases, maintain pH 7.45 to 7.55. -- Diazepam 5 mg IV, or lorazepam 2–4 mg IV. -- Lignocaine 1.5 mg/kg IV bolus, followed by 2 mg/min infusion. Watch out for adverse effects (Table 34.10). Procainamide may also be used with caution. -- Defibrillation (if haemodynamically unstable). –– Aspirin to inhibit platelet aggregation. Watch out for increased thyroxine levels. –– For systolic BP higher than 100 mmHg, administer sublingual nitroglycerine or nifedipine 10 mg orally, or phentolamine 1 to 5 mg IV (followed by a drip of 10 mg in 1 litre of D5W at 10 ml/min). --For life-threatening arrhythmias, use of type IA antiarrhythmic agents may be considered (with caution). --Thrombolytic therapy may be necessary if myocardial infarction is not amenable to relief by nitrates, calcium channel blockers, or phentolamine. Caution about the use of throm-bolytics in cocaine-associated acute myocar-dial infarction (AMI) is generally advocated. Thrombolytics should be avoided in patients with cocaine-induced myocardial infarction and uncontrolled hypertension, because of the increased risk of intracranial haemorrhage. However, some investigators feel that the risk is often exaggerated. h. Aortic dissection: The hypertension that precipitated aortic dissection must be controlled immediately with nitroprusside and calcium channel blockers. –– Frusemide 20–40 mg IV. –– Morphine sulfate 2 mg IV titrated to pain relief. –– Nitroglycerine drip titrated to blood pressure or respiratory status. –– Phentolamine or nitroprusside (if necessary). –– Incubate and ventilate. –– Monitor fluids with pulmonary artery catheter. j. Rhabdomyolysis: Early aggressive fluid replacement is the mainstay of therapy and may help prevent renal insufficiency. Diuretics such as mannitol or furosemide may be needed to maintain urine output. Urinary alka-linisation is not routinely recommended. –– Serial serum creatine kinase and urine myoglobin studies. –– IV hydration (urine output must be maintained at 3 ml/kg/hr). –– Dopamine (3 mcg/kg/day) and frusemide (60 mg three times a day) may reduce renal vascular resist-ance and help in reducing the number of haemodi-alysis required to reverse oliguria. k. Acidosis: Correction of acidaemia through supportive care measures such as hyperventilation, sedation, active cooling, and sodium bicarbonate infusion can have beneficial effects on conduction defects. l. Elimination enhancement measures: Cocaine is rapidly metabolised. Forced diuresis, urine acidifica-tion, dialysis, and haemoperfusion are ineffective in significantly altering elimination. Increasing the level of butyrylcholinesterase in the blood (which metabolises cocaine to inactive compounds) could help in rapidly inactivating cocaine in acute intoxications. A number of psychological and pharmacological approaches to the treatment of cocaine dependence have been tried with varying degrees of success. A combined approach judiciously tailored to the needs of individual patients offers the best hope of preventing relapses. a. Psychotherapy: This involves cognitive-behavioural, psychodynamic, and general supportive techniques. One example of a cognitive-behavioural method uses contingency contracting, in which it is agreed in advance that for a specified period of time (e.g. 3 months), if the patient uses cocaine (as detected by supervised urine testing), the therapist will initiate action that will result in serious adverse consequences for the patient, such as informing the employer. –– Interpersonal group therapy focuses on relation-ships, and uses the group interactions to illustrate the interpersonal causes of individual distress, and to offer alternative behaviours. –– Modified dynamic group therapy is concerned with emphasising character as it manifests itself indi-vidually and intrapsychically, and in the context of interpersonal relationships with a focus on affect, self-esteem and self-care. c. Group counselling: The most widely used form of psychosocial treatment for cocaine dependence is group counselling, in which the group is open-ended with rolling admissions; the group leaders are drug counsellors, many of whom are recovering from addiction, and the emphasis is on providing a supportive atmosphere, discussing problems in recovery, and encouraging participation in multistep programmes. –– Several drugs have been tried to help ameliorate the manifestations of cocaine withdrawal. Many of these (fenfluramine, trazodone, neuroleptic agents, etc.) have either not demonstrated clinical efficacy, or have produced serious side effects. –– Bromocriptine has successfully reduced cocaine craving and decreased withdrawal symptoms in several studies. Oral doses of 0.625 mg given 4 times daily may produce a rapid decrease in psychiatric symptoms. When given in a single dose of 1.25 mg, bromocriptine has been found to decrease cocaine craving. In one study, the dosage suggested was 1.25 mg orally twice daily, with titration up to 10 mg per day within the first 7 days. Dose can be decreased in patients experiencing adverse effects. –– Amantadine, a dopamimetic agent, increases dopaminergic transmission and has been found to be useful in the treatment of early withdrawal symptoms and short-term abstinence. The usual dose recommended is 200 mg to 400 mg orally, daily, for up to 12 days. It is probably as effective as bromocriptine, and less toxic. –– Tricyclic antidepressants may be useful for selected cocaine users with comorbid depression or intra-nasal use. –– Initial studies with fluoxetine promised good results, but craving actually worsened in some patients. Several studies indicated better effi-cacy with carbamazepine for controlling craving. Carbamazepine at doses of 200 to 800 mg orally, 2 to 4 times daily has benefited some patients. Phenytoin also shows promise in helping to sustain abstinence from cocaine in some patients. –– Recent approaches include the employment of agents that selectively block or stimulate dopa-mine receptor subtypes (e.g. selective D1 agonists), and drugs that can selectively block the access of cocaine to the dopamine transporters, and yet still permit the transporters to remove cocaine from the synapse. –– Another approach is aimed at preventing cocaine from reaching the brain by using antibodies to bind cocaine in the blood stream (“cocaine vaccine”). e. Acupuncture: Use of auricular acupuncture to treat cocaine abuse has become popular of late, though controlled studies of its efficacy have not shown convincing results. Herbal teas are often consumed as part of the treatment. Unfortunately, drop-out rates are generally high. 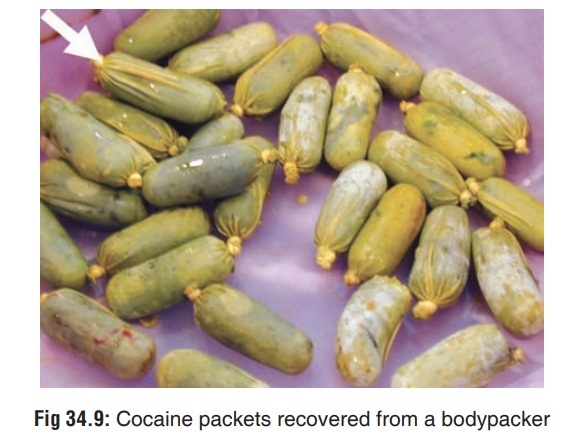 The practice of swallowing balloons, condoms, or plastic packets filled with illegal drugs for the purpose of smuggling is called “body packing”, (Fig 34.9) and the individual who does this is referred to as a “mule”. This must be differentiated from “body stuffing” in which an individual who is on the verge of being arrested for possession of illegal drugs, swallows his illicit contraband to conceal the evidence. Leaking from these poorly wrapped packets can produce cocaine toxicity. Sudden death due to massive overdose can occur in either a bodypacker or a bodystuffer, if one or more of the ingested packages burst within the gastrointestinal tract. Fatal cocaine poisoning has occurred with the rupture of just a single package. –– Emesis, lavage, charcoal, as applicable. –– Cathartic/whole bowel irrigation to flush the pack-ages out of the intestines. –– Symptomatic patients should be considered a medical emergency, and be evaluated for surgical removal of the packets. –– Asymptomatic patients should be monitored in an intensive care unit until the cocaine packs have been eliminated. This must be confirmed by follow-up plain radiography and barium swallows. –– Bowel obstruction in asymptomatic patients may necessitate surgery. Endoscopic removal has been successful in some cases. · There are no specific findings at autopsy, except for nasal septal ulceration and perforation if the deceased had been a long-term abuser of cocaine. Histological study of nasal septal mucosa in such cases may reveal characteristic changes including arteriolar thickening, increased perivas-cular deposition of collagen and glycoprotein, and chronic inflammatory cellular infiltration. · Histopathology of heart may demonstrate microfocal lymphocytic infiltrates, acute coronary thrombosis, early coagulation necrosis of myocardial fibres, and non-athero-sclerotic coronary obstruction due to intimal proliferation. · Cocaine can be recovered by sampling from recent injec-tion sites, or by swabs from the nasal mucosa. It can also be recovered from the liver and especially brain, where cocaine may be found not only in dopamine-rich areas such as caudate, putamen, and nucleus accumbens, but also in other extra-striatal regions. Specimens obtained postmortem should be preserved with sodium fluoride, refrigerated, and analysed quickly. Tissue specimens should be frozen. · Cocaine has been abused for centuries, but its toxic proper- ties have been studied extensively only in the last couple of decades. In the current drug subculture, cocaine has become the “champagne drug” because of its cost and relative scarcity. Cocaine is a “rich man’s drug” since the poorer classes cannot afford to sustain a drug habit that costs thousands of rupees every week. Therefore in India, cocaine abuse is restricted mainly to the affluent classes of society. The prevalence and extent of the problem among newer generation Indian film actors in recent times has become apparent with the arrest of several filmstars for possession of cocaine. Several high profile artists, socialites, and even politicians have been caught with cocaine possession. · Cocaine has always been popular with musicians (espe- cially jazz and rock), other artistes, and film personalities. There are innumerable rock songs eulogising the drug directly or indirectly. · Mumbai, Delhi, and Bangalore have no qualms about drug abuse, and even openly admit to using “party drugs” such as cocaine as a “cool” mode of recreation. Since cocaine has a reputation of enhancing sexual pleasure, such wide-spread abuse has also led to increased spread of sexually transmitted diseases such as AIDS because of high-risk sexual practices among the users. · Cocaine abuse by pregnant mothers can lead to devastating effects on the foetus and the new-born (Table 34.11). There is convincing evidence that cocaine is teratogenic and can play an important role in the causation of several serious congenital anomalies (Table 34.12). · Cocaine abuse is well known for its propensity to cause sudden death not only due to its deleterious effects onhealth (cerebrovascular accidents, myocardial infarction, malignant hyperthermia, renal failure), but also due to its capacity to provoke the user to commit acts of aggression and violence. Deaths due to massive overdose are especially common among those who smuggle the drug within their bodies (“cocaine packers”). · Cocaine toxicity has been reported in children receiving topical adrenaline and cocaine for local anaesthesia.